Jon Davidann received his Ph.D. from the University of Minnesota in 1995 in U.S.-Japanese history. He came to Hawai’i Pacific University in 1997. He is currently writing a monograph on the rise of American and East Asian concepts of modernity in the twentieth century called The Limits of Westernization. In 2012, he published a textbook entitled Cross-Cultural Encounters in Modern World History (Pearson). His most recent monograph, Cultural Diplomacy in U.S.-Japanese Relations, 1919-1941, a study of the rise and eventual failure of U.S.-Japanese cultural diplomacy leading up to the Pacific War, was published by Palgrave MacMillan in 2007. His first book, A World of Crisis and Progress: The American YMCA in Japan, 1890-1930, studied cultural imperialism and cultural nationalism in the interaction between American YMCA missionaries and Japanese Christians in Japan. 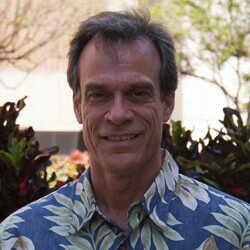 Professor Davidann also published an edited book called Hawaii at the Crossroads of the U.S. and Japan before the Pacific War (University of Hawaii Press, 2008). He has published articles in the Journal of World History and the Journal of American-East Asian Relations and has received numerous grants and fellowships to undertake his research projects. He received a Golden Apple research award from Hawai’i Pacific University in 2009, and studied at Oxford University as a visiting fellow in 2008. He has given invited lectures internationally, serving as a KAKENHI scholar in Japan in May 2017, and as a Fulbright Specialist at Ghent University in Ghent, Belgium and the Satsuma Chair at Catholic University in Leuven, Belgium in October 2017. He teaches courses on American cultural diplomacy, global history, the history of oil, and the history of economic crisis. He is a regular guest on ThinkTech Hawaii’s Global Connections show with host Jay Fidell. Davidann lives in Kailua with his wife Beth and their dog, Neilani. His hobbies are bicycling, SUP, and reading.